Transform your existing wood-burning fireplace in to a real flame gas-fueled fireplace and never worry about hauling wood, messy ashes or soot again. This heater comes with the most realistic natural fire and highly detailed logs that glow like real wood. Comes with five ceramic logs, adding a realistic appearance to the high end appeal of the heater. The 18″ Vent Free 38,000 BTU Gas Log heater is perfect for rooms of 1,100 square feet or more. This vent free unit requires no electricity, making it a great alternate heat source during power failures, while being energy efficient at all times. 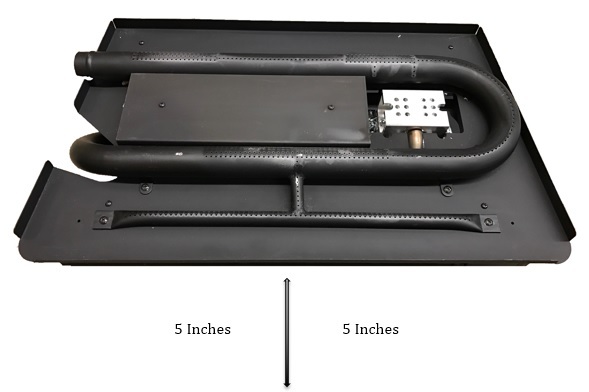 The dual fuel version of this heater allows the professional installer to set up the unit for either propane or natural gas, with no manual switching required. Available in single fuel in some markets. Equipped with an Oxygen Depletion Sensing (ODS) safety shutoff system. 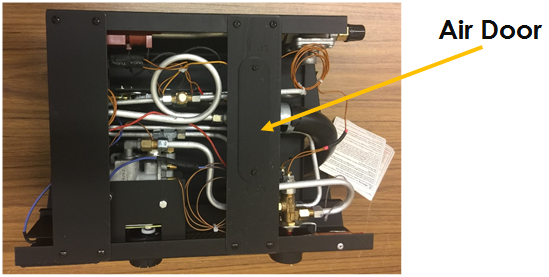 The ODS/pilot shuts off the heater if there is not enough fresh air. This heater is equipped with a PCB controlled automatic ignition system. No AC power supply required. Battery should be periodically checked and replaced accordingly. If you have the dual fuel model, your heater is equipped to operate on either propane or natural gas. It will automatically identify your gas source without any manual changes, so no switching is necessary. 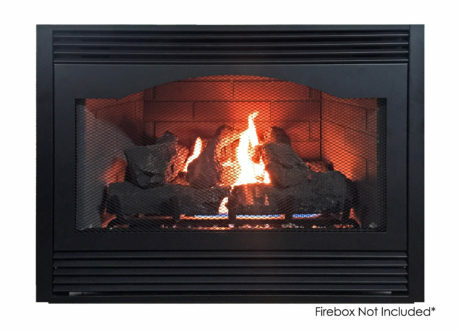 Our gas logs have a built in regulator with a 3/8 inch male flare that requires a 3/8 inch female UNF connection to a 1/2 inch gas flex hose. 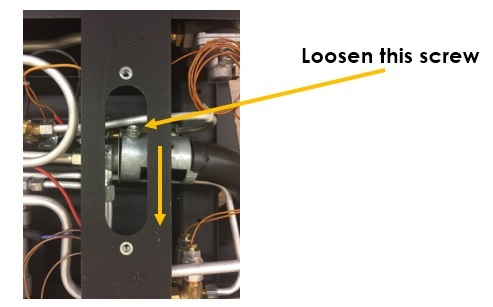 The flex hose should be connected to a MINIMUM ½ inch gas line to ensure proper pressure. You must have a shut off valve installed on the gas line near the heater. Click HERE to purchase a kit that will provide the flex hose, fittings, and shut off valve all in one. b) Connecting, installing, testing, repairing, or servicing equipment; that is experienced in such work; that is familiar with all precautions required; and that has complied with all the requirement of the authority having jurisdiction. We at Reecon strive to produce the highest quality Thermablaster heaters to warm our customers. We feel that a heater should look as good as it operates and work without a fuss. That is why we have developed our patent pending dual fuel heating system, which allows the use of either liquid propane or natural gas for some of our most popular products, without requiring any adjustments. Our product lines consist of vent free gas wall heaters, a direct vent gas wall heater line, kerosene and propane forced air heaters, electric industrial heaters, fireplace sets, as well as outdoor heating products. Through our innovative product design and customer first mentality, we strive to provide the best heaters for all needs, at a price that won’t break the bank. Placement of Glowing Ember and Stones. All of our Gas Log Sets come with two bags with decorative stones and embers. The large bag contains a simulation of stones made out of a foamy material, which you can place on the burner. 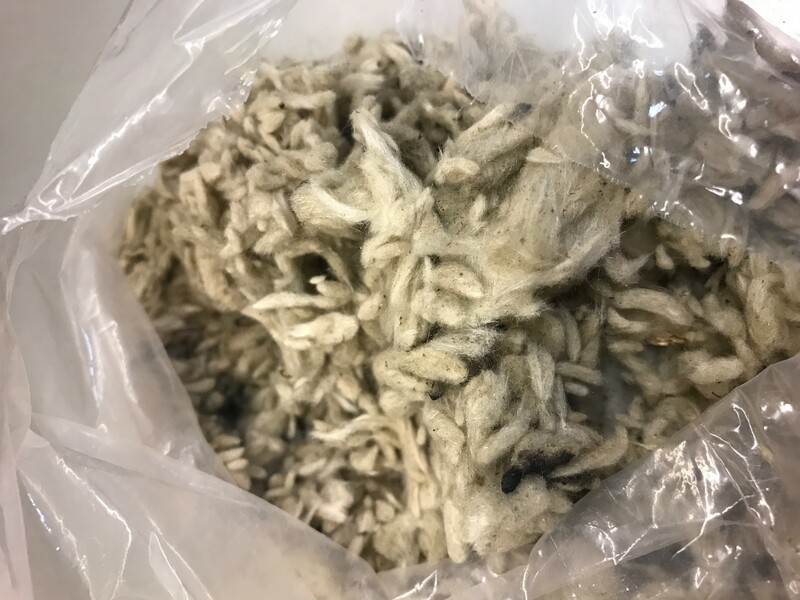 The smaller bag contains a material very similar to cotton. These are glowing embers. The stones can be placed as you prefer, but you need to follow these clearances. 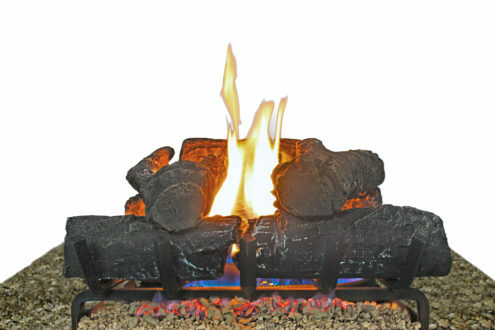 You CAN NOT place anything in front of the gas log set closer than 5 Inches. We recommend you place the stones on the front tray of the unit as shown in the picture below. Now, you will place the glowing embers covering the front burner, as shown below. 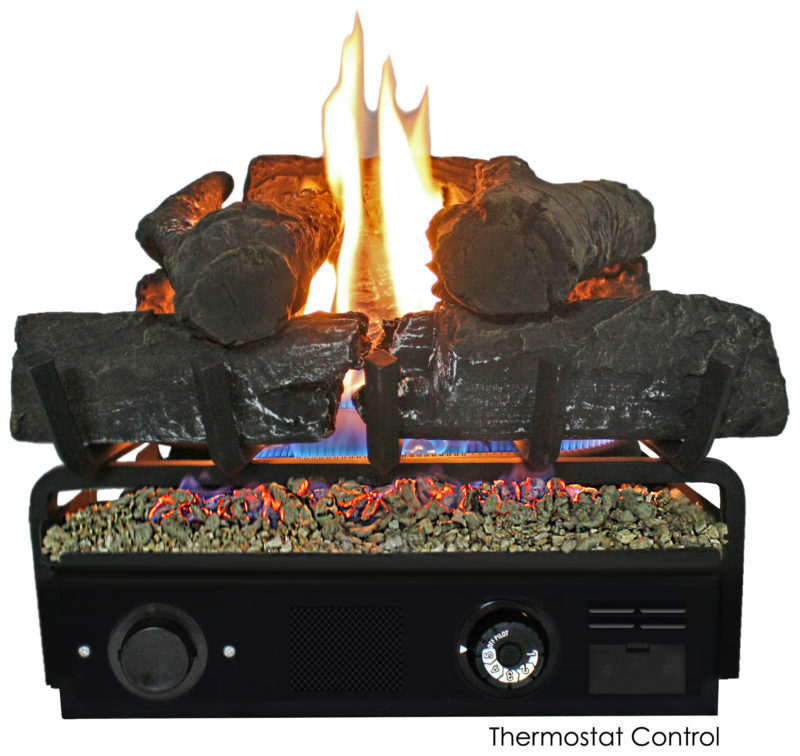 The embers help create the look of smoldering wood embers. 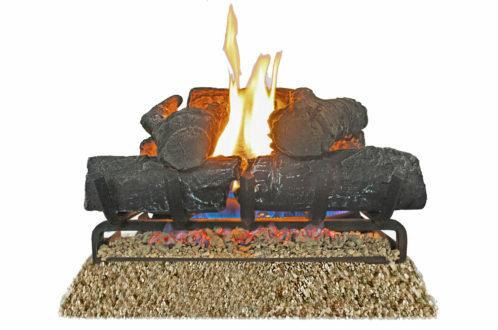 A simple solution to giving your fire a beautiful and more natural look, when the flames from your fire hit these embers, they glow red like real wood. These are non-consuming, so they can be lit and re-used many times. After you set everything, it should look similar to the picture below. 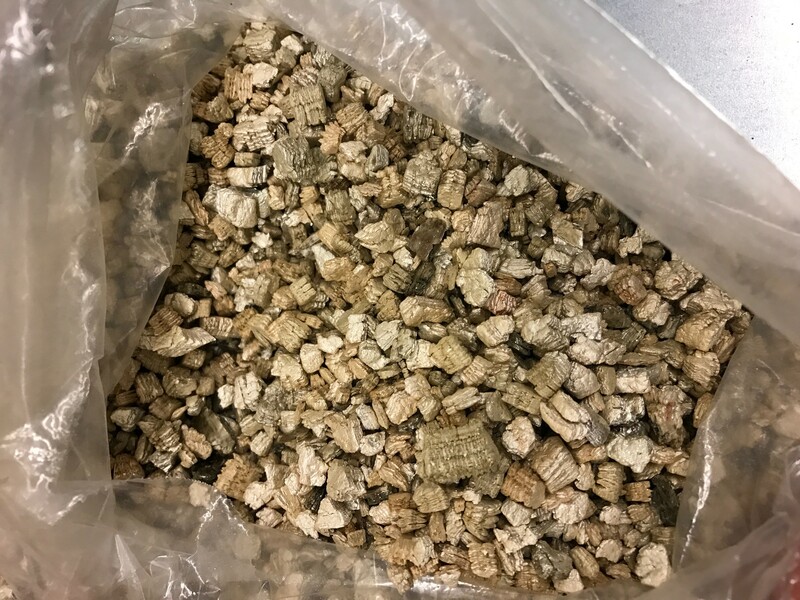 Keep in mind, the stones and glowing embers are intended for decoration and are meant to be placed as the customer sees fit as a personal touch. If you would like some guidance on the placement. please reach out to us to discuss further at 877-670-8428 or service@thermablaster.com. Setting the Air Door to the appropriate gas type being supplied to the log set is important, as it improves the color and appearance of the flame. The Air Door is located on the bottom of the log set heater. So, you will need to flip it over. I recommend laying a cloth down so that the metal of the burner does not rub on the floor. You will want to look for an oval shaped cover that has two screws. You will unscrew this door, revealing a silver cylinder shaped part that has a single screw. The unit comes preset for Propane, so at first, the screw will be facing towards LP (Liquid Propane). 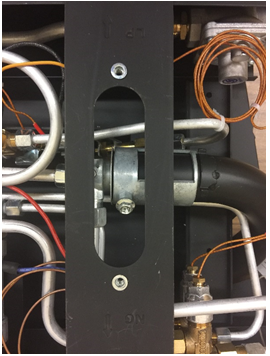 Then, with your screwdriver still contacting the screw, slide/rotate the cylinder towards the NG (Natural Gas) side, until it cannot slide any further. Once done, you will tighten the screw on the cylinder, then seal the air shutter cover again. For more information, you can contact us at 877-670-8428 or via email service@thermablaster.com.